A couple of years ago we were at Bass Pro Shop to do some shopping. The Bass Pro Shop in our area hadn’t been open long and we were not aware they had Santa’s Wonderland during the Christmas holiday. Since we were there and the line to see Santa was so short, we decided to let the girls have a visit with Santa and get their picture taken. Naomi was happy to sit on Santa’s lap, but Lili was unsure about the visit. Reluctantly, she agreed to stand next to Santa for a picture and told him what she wanted for Christmas. We got our free photo and headed off to finish our shopping. Last year we headed back to Bass Pro Shop to see Santa again. After all, when we think of Bass Pro Shop, we think Santa! The girls were excited about the trip, but this time the line was unbelievably long. We had to take a number and wait. When our turn finally arrived Lili didn’t hesitate and marched up to sit on Santa’s lap. This time, Naomi was more than reluctant. She refused to go near the jolly old elf and instead stayed back with daddy, watching as Lili told Santa what she wanted for Christmas and also telling him what Naomi wanted for Christmas. She got her picture taken, was given her candy cane and off we went with our free photo in hand. 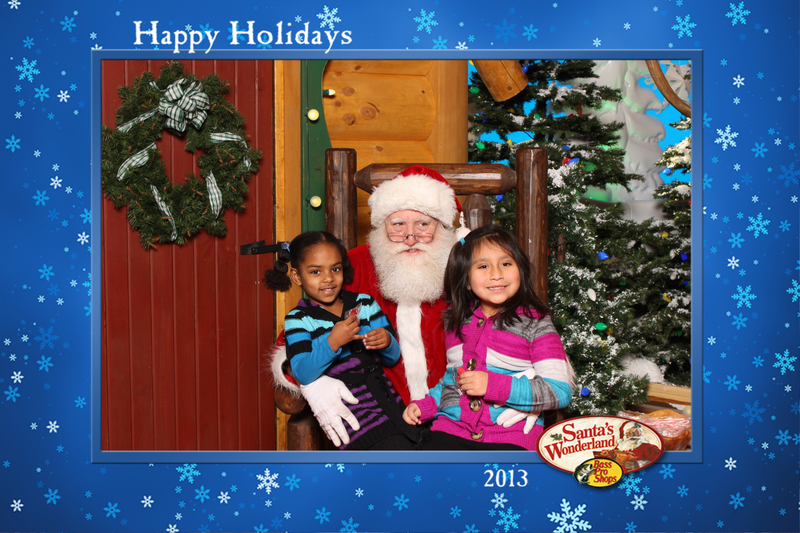 This year the girls wanted to go back to Bass Pro Shop to see Santa. After all, it’s now become a family tradition. In an attempt to avoid the long lines of the previous year, hubby took the afternoon off from work so we could get their early. Going on a weekday afternoon had to be better than going on a weekend and we were right. We watched a little baby get her first picture with Santa, followed by a little boy who was not very excited about seeing Santa. Then it was our turn. Both girls marched up to Santa, Naomi climbing on one knee and Lili on the other. They got their picture taken, both telling Santa they had been good girls this year and then telling him what they wanted for Christmas. He gave each of them their candy cane and as they climbed off his lap told him good-bye and Merry Christmas. We waited to see the picture intending to get our free photo and leave, but this time I had to make a photo purchase. Not only was it the first time both girls happily sat on Santa’s lap, but this photo needed to be shared. Have fun!!! Hope you’ll share your pictures as well. Awesome picture of the 2. Naomi looks so mature! We have an extra copy if you would like one.